A continuation of my previous post. Have some more interesting words! I enjoy all of these, and recommend using them with unadulterated abandon. ♥Bellicose - aggressive, hostile. Currently being chucked around by the media in relation to North Korea. ♥Bleb - learned this one in Biology! It's a little bubble. ♥Cirrous - resembling slender tentacles or filaments. ♥Fescennine - extremely rude. Therefore, a stronger version of agrestic. ♥Finnimbrun - a trifle, a trinket. ♥Harbinger - a herald, a forewarning. ♥Masticate - no, nothing like that! It means 'to chew'. ♥Mesonoxian - related to midnight. ♥Nacreous - relating to mother-of-pearl, pearlescent. ♥Otiose - without a practical purpose. ♥Pejorist - someone who reckons the world is going down the drain. Me, then. ♥Perspicacious - being very perceptive. ♥Requiem - a mourning song, a funeral song. ♥Sidereal - relating to stars. I will get around to uploading all the Harry Potter photos soon! It's just there are a lot of them and effort, but! What I really wanted to say (and should have said before) was that Quantum Entanglement is completely finished and now I'm on the final short! It's been renamed 'Spidermusings', which is at once apt and a casual abuse of the english language. It's also so nearly done. It's been a lot of fun too - it's from the point of view of a particularly nasty and unreliable narrator; and getting into his head has been pretty interesting. However there is now about one more thought-track to write and I cannot find the motivation to do so. Never mind that this is the last story in the collection that I have left to write, it's the culmination of almost a year's work. However; my next update will probably be that I've finished the collection! Which is really rather exciting - I'll have to edit/copyedit, and I'll finally be able to read the whole thing in the order it was intended. Then, I can somehow learn how to make it an ebook and publish it. Which is a really scary thought. 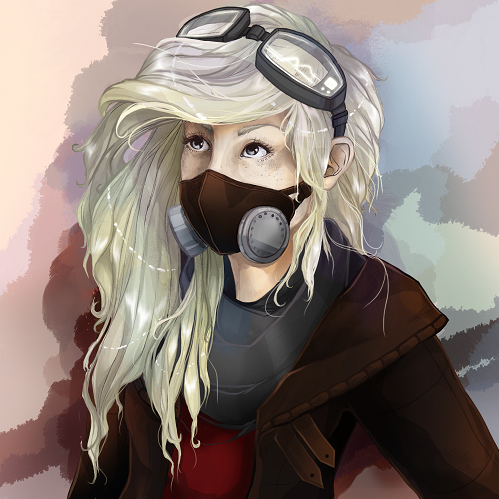 I also drew this picture of Lilia, because gas masks are awesome.